"Happy 100th Anniversary Split Rock!" 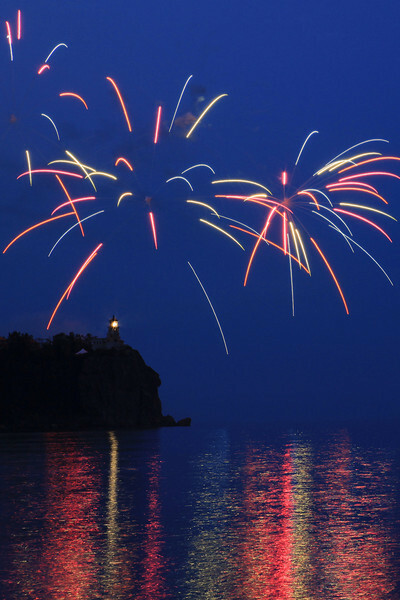 To celebrate the 100th Anniversary of Split Rock Lighthouse, the light was lit and fireworks were launched over the lighthouse on the evening of July 31st, 2010. Several hundred people were in attendance, including a LOT of photographers! 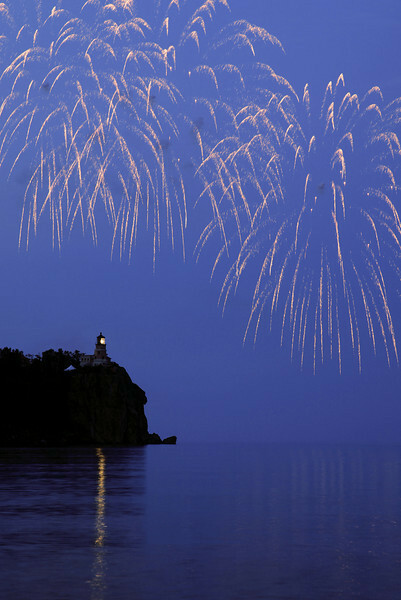 It was a special evening, and a rare treat indeed to see fireworks launched over the light. Taken along the Pigeon River in Northeast Minnesota. I love lilies, but taking a nice photograph of them is a challenge. 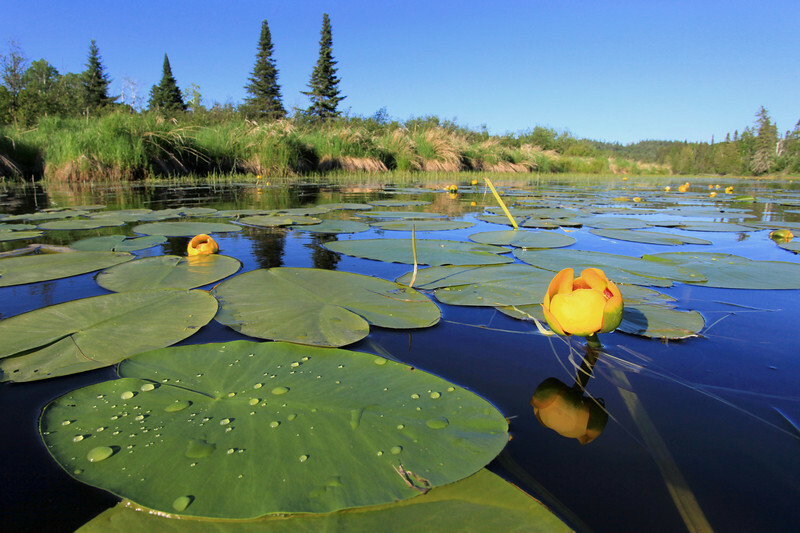 This was shot from my kayak without looking through the camera's viewfinder. I held the camera as close to the surface of the water as possible and pressed the shutter button… “shooting blind”, so to speak. It took several tries to get a level horizon! Check out my latest night-time photographic creation at the Spirit Tree. There were lights coming from four different sources in this image... the stars, the moon (which was rising off to the right), the city lights of Thunder Bay, Ontario and that obnoxious bright white light in the center of the photo, which is coming from a couple of spotlights at the U.S. Customs border inspection station. I have been noticing that bright light in several of my recent night images. 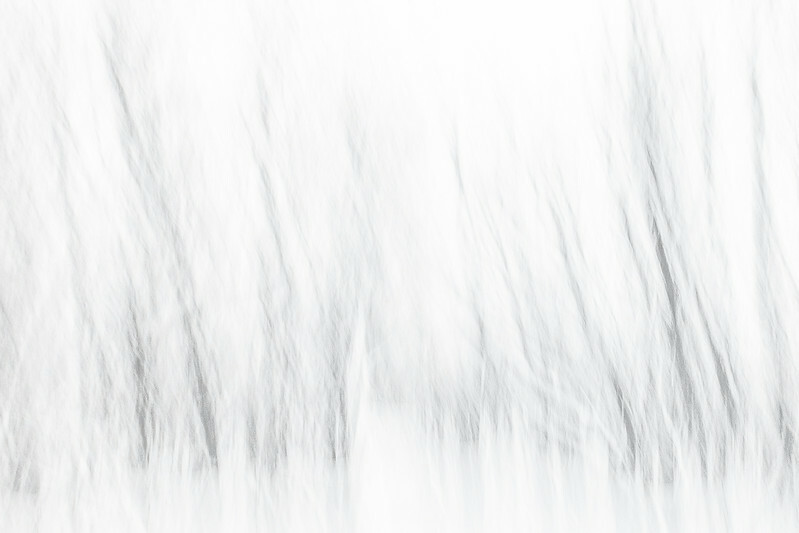 I kind of like the effect it has on this image, but most of the time I wish it wasn’t there. 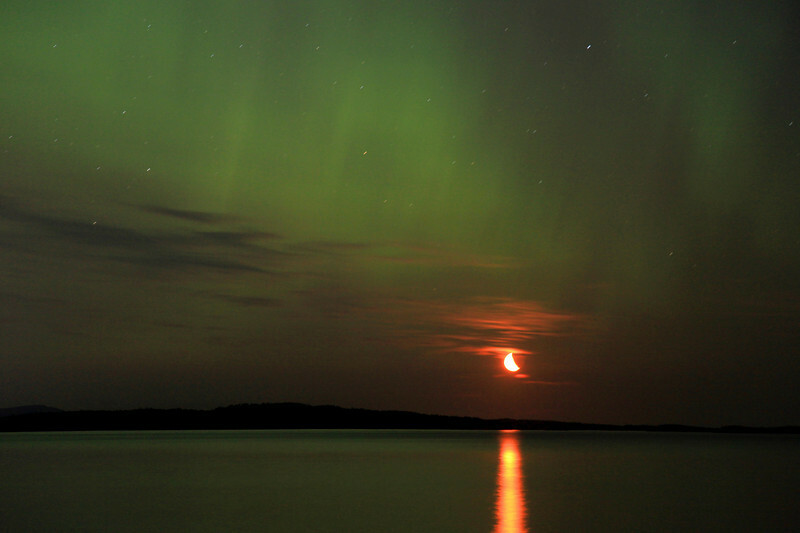 "Northern lights moonrise over Wauswaugoning Bay"
Well, the aurora made a pretty good showing last night! It sounds like most everyone had cloudy skies but lucky for me the clouds didn't move in up here until after the aurora faded. The lights put on a pretty good show from about 11:00 p.m. to 12:00 a.m. Here are my favorite images from last night! 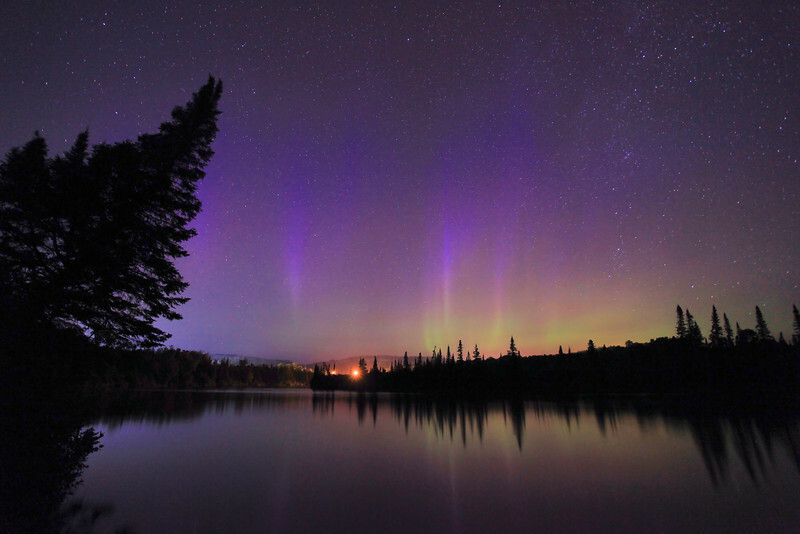 These images of the Aurora Borealis were made last night at 10:45 p.m. over the Pigeon River in Northeast Minnesota. Many rumors were circulating that the aurora was going to show up again last night, so I figured it was worth it to head out again to watch the sky. I met up with my friend Nate and we headed over to the river at 10:00 p.m. Only moments after we arrived at the river we started seeing vertical shafts of light appearing in the sky. Like the previous night, the lights lasted for a little over an hour before diminishing entirely for the rest of the night. For those that might not know, the Pigeon River IS the border between the U.S. and Canada in Northeast Minnesota, and the man-made lights that you see near the center of this image are the lights on the Highway 61 bridge over the river. Last night was the first time I've made night images from this location. It was a terrific spot, so rest assured that you'll be seeing more night-time images from this location in the future! "Glowing sky over the Pigeon River"
I went out with a few local youth last night to look for the northern lights. 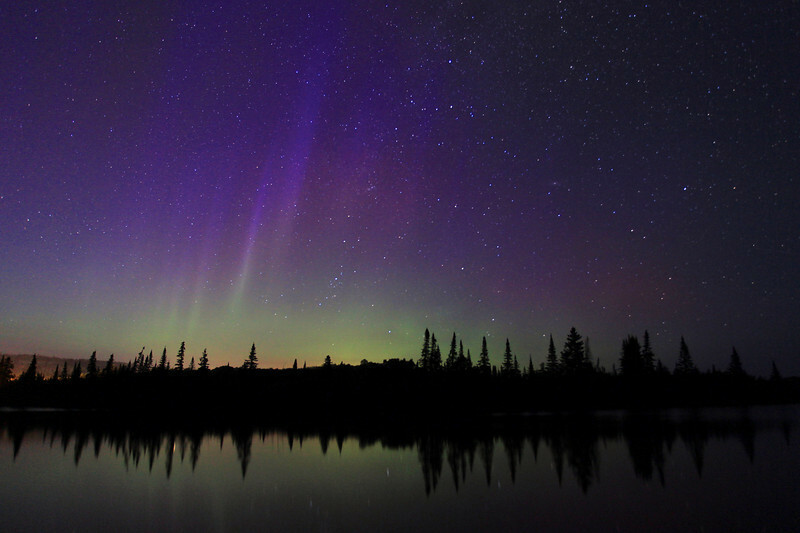 While the aurora was visible, it was very, very faint. 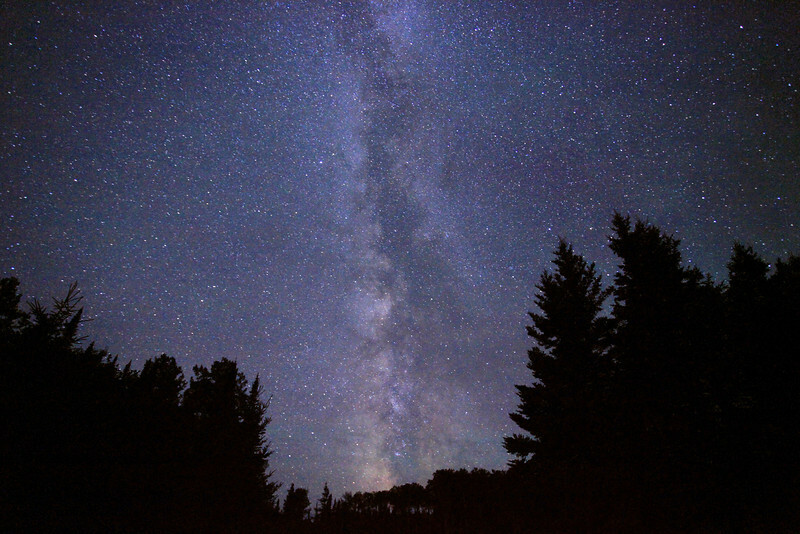 The Milky Way, however, lit up the sky! This image was made at about 12:30 a.m. Exposure time was 30 seconds, aperture f4.0, ISO 6400. It was also the coolest night (temperature-wise) that we've had in a while. It actually dipped slightly into the 40's last night. This was good for high ISO photography, as the temperature cools the camera's sensor doesn't build up as much heat and therefore generates less noise in the final image. Enjoy! 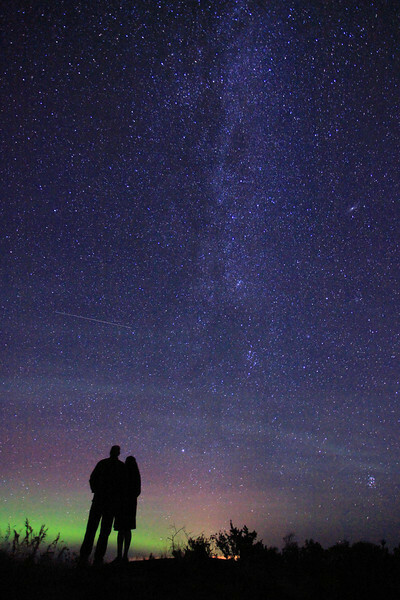 "Sky Watchers (Auroras and Perseids and Milky Way, Oh My!)" Just got in from watching and shooting the Milky Way, Northern Lights and Perseid meteor shower from the top of Mt. Maude. What an amazing night! 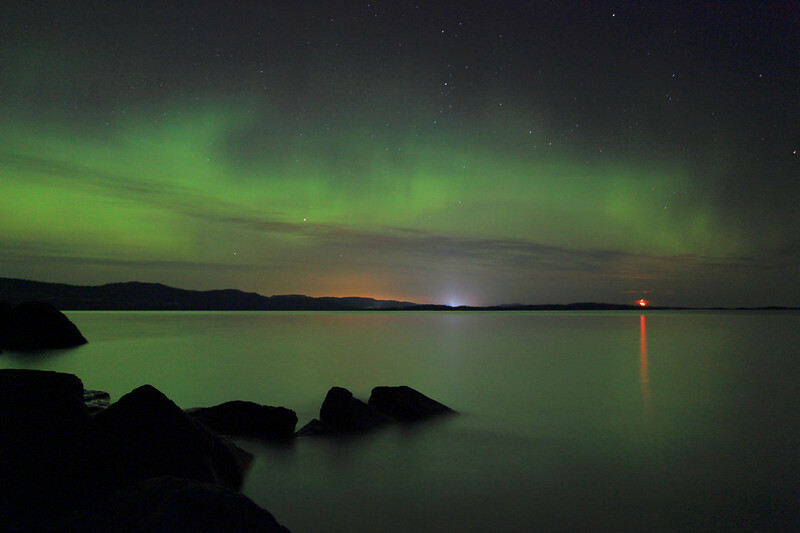 The northern lights were very low along the horizon, but they were dancing and putting on a decent show. Yet again, I am amazed by the wonders of the night sky! This photo shows my friends Jake and April enjoying the amazing sky. "Low water on the Pigeon"
This evening we went for a kayak outing on the upper Pigeon River. Boy, the river sure has changed since the last time I was on it a couple of weeks ago. The water is very low now. 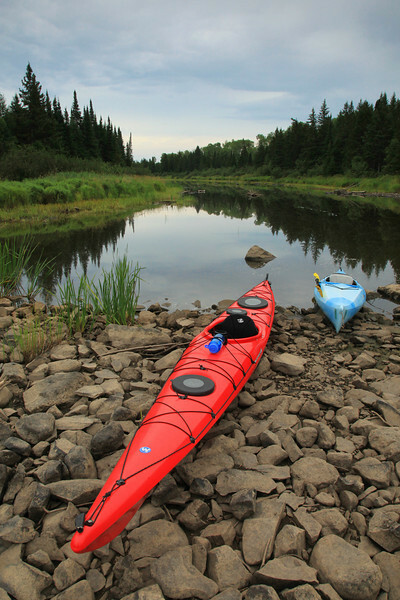 In fact, the hulls of our kayaks scraped rocks more times than we could count. In some areas, such as this spot just below English Rapids, almost the entire width of the river bed is dry exposed rock. Two months ago I was able to easily float right over these rocks... that's not going to happen now! This was the view of the Susie Islands on my way to work today. 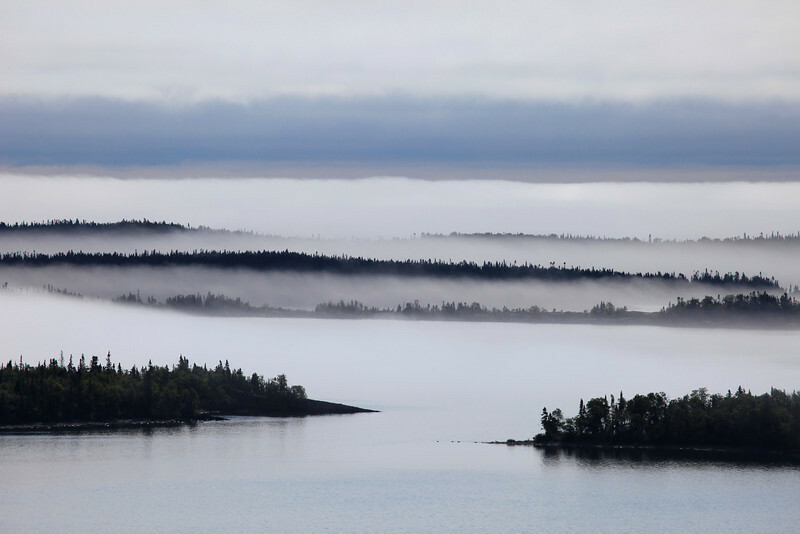 The fog was spectacular! I couldn't resist this scene, I just had to pull over and take a few pictures! 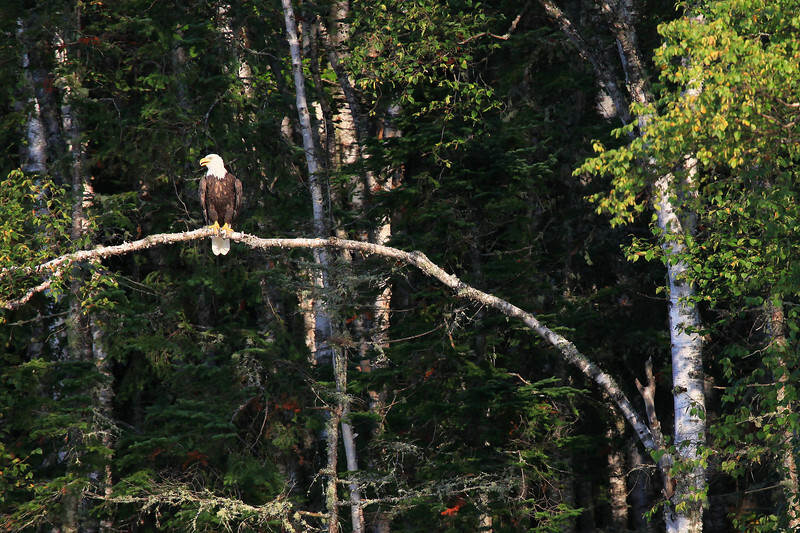 "Eagle near the mouth of the Pigeon River"
During last night's boating venture out into Pigeon Bay, we saw a Bald Eagle flying around as we neared the mouth of the river. As we approached he landed in a tree on the right side of the river. At first we couldn't see him but as we got closer he soon came into view. I got quite excited when he came into view and I saw him perched on this cool bent-over Birch branch! Lots of times when Eagles are perched in trees they either blend into the background or have lots of other branches blocking the view. This one was right in the open, with some darker shadows behind. I thought it made for a great shot. "Night rider on the big lake"
Just got in from a TERRIFIC moonlight shooting session on Magnet Island in Lake Superior. My friend Jacob and I experienced some awesome moonlight, including an ore boat that was all lit up as it passed through the reflection of the moonlight on the lake! 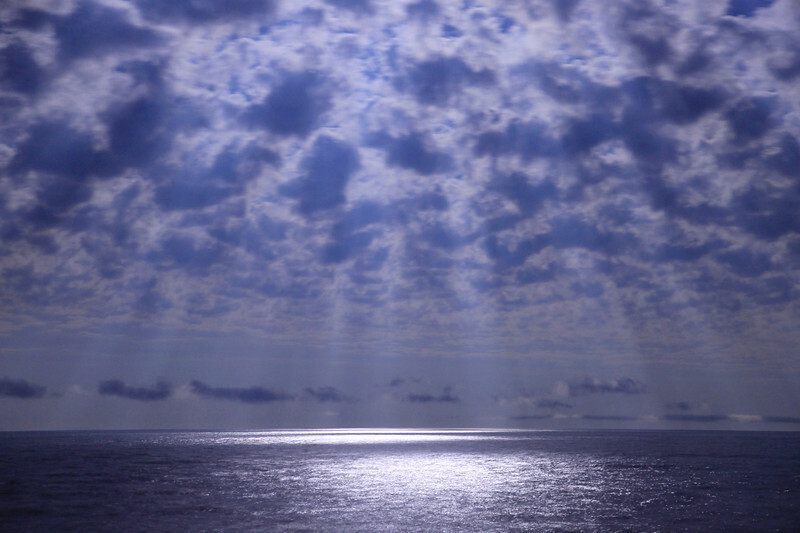 At one point during the evening, some really patchy clouds went over and the moonlight was shining through the clouds in the form of all these "moon rays". It was a heavenly scene! Another moonlight adventure logged in the memory banks! 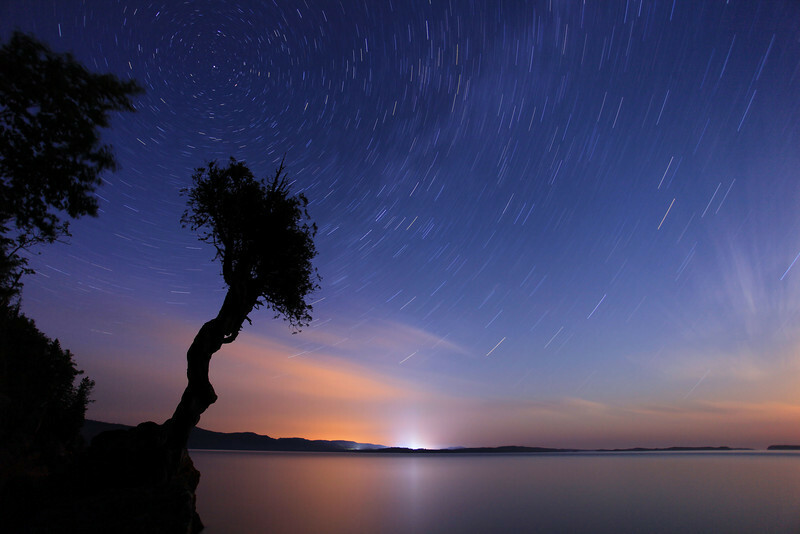 Started off with sunset on Magnet Island followed by several hours of moonlight and star shooting. Moved over to Big Susie Island, more moonlight shooting then slept under the moon on a bed of moss. 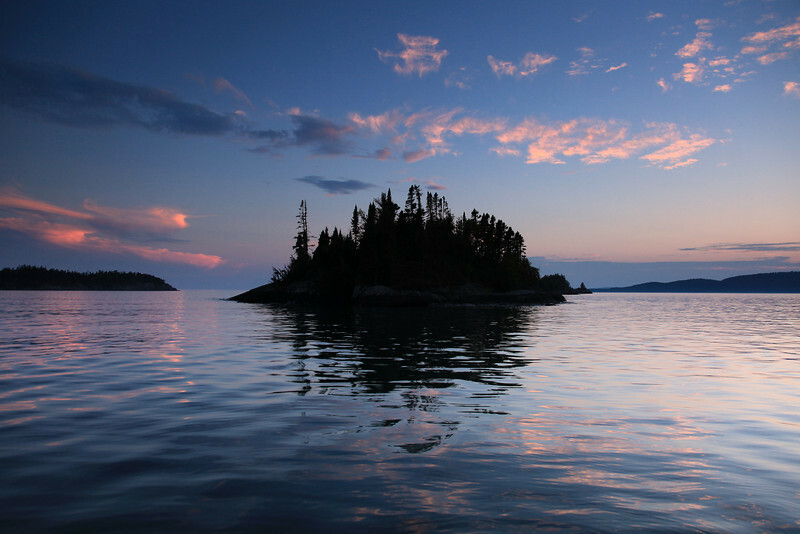 Shot an OK sunrise over Porcupine Island. 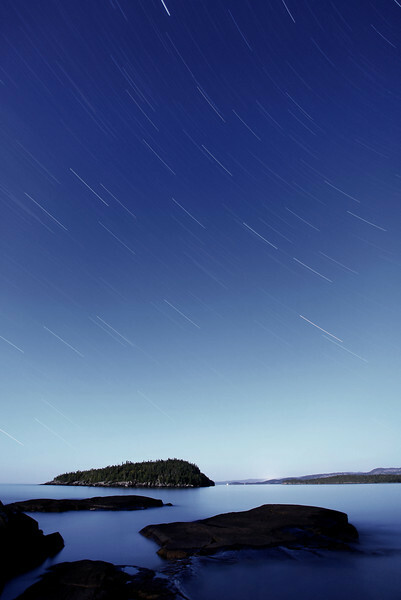 This 35 minute exposure of the night sky was taken from Magnet Island on August 27th, 2010 from 9:30 p.m. to 10:05 p.m. 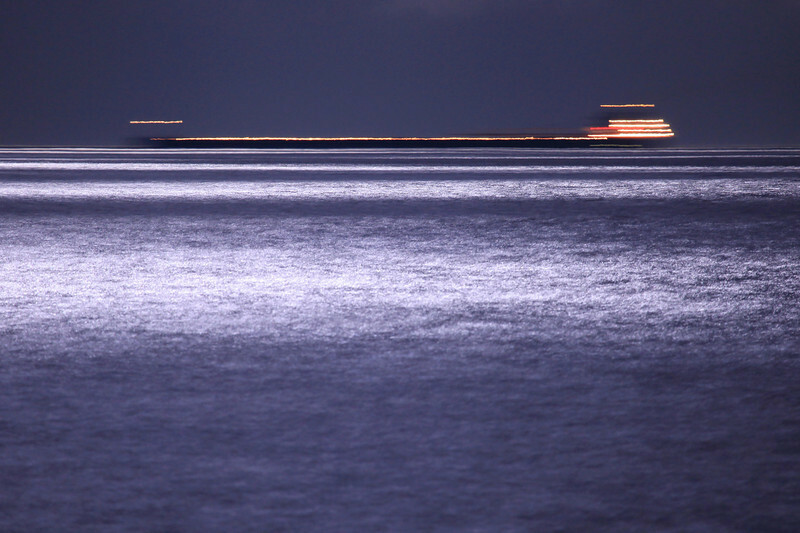 The moon was rising behind me, which provided for some illumination on the water and the rocks/islands in the distance. This is my first successful star trail image from the Susie Islands. I hope you enjoy viewing it as much as I enjoyed making it! As its name implies, Long Island is a very LONG but narrow island in the Susie Islands. Only about 100 feet wide at its widest point, it is roughly one half-mile in length. This photo was taken at sunset over the East end of Long Island. "August Dawn, Big Susie Island"
As a photographer I find myself wishing for some nice clouds whenever sunrise or sunset rolls around... but sometimes its nice when there aren't any clouds. There is a certain beauty to a sky without clouds, an uncluttered beauty. In such situations my favorite images are almost always made either well before the sun comes up or well after it goes down. With the lack of clouds the sky most often takes on a beautiful blue glow during the moments of dawn and dusk. 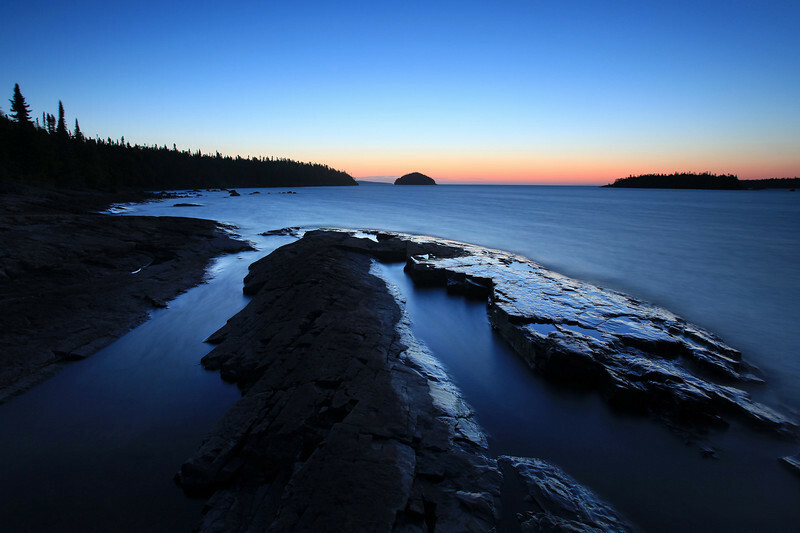 In this image the rocks in the foreground, wet from the splashing of waves from Lake Superior, reflect that beautiful blue glow of the sky. This image was made almost 45 minutes before the sun broke the horizon. I love water and I love rocks. The combination of the two along with some late evening or early morning light and I'm in photographic heaven. I never tire of making images like this one, and I hope that you never tire of viewing them. 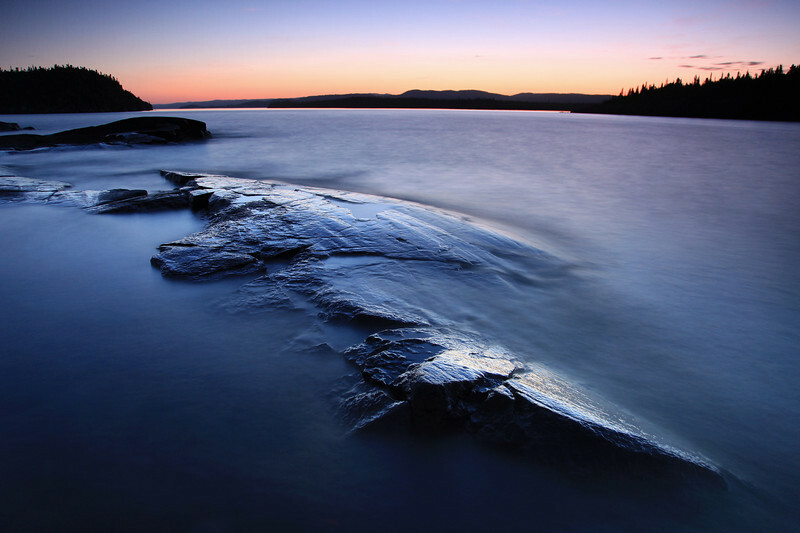 This particular rock formation is on the Western tip of Magnet Island in Lake Superior and was photographed almost an hour after sunset.